Dustin Veitch. Photo by: Photo by Herry Himanshu/@herry.with.an.e. Dustin Veitch was born in the United States, but was brought up in Regina, SK., where he now lives and works. His Instagram is filled with photographs of beautiful moments in Regina, celebrating landscapes, love and life. Though, photography is not Dustin’s full-time gig. It’s a past time he has turned into a freelance opportunity, giving Dustin freedom to choose the projects he wants to work on and when. Four years ago, Dustin found photography and he hasn’t put down the camera since. 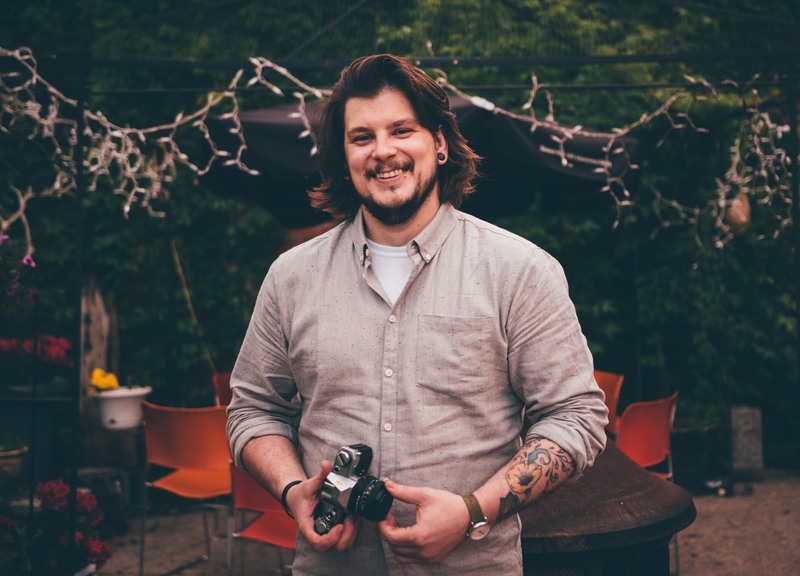 Dustin tells A Quarter Young that though he faces challenges through his work, as all of us do, photography is a way for him to connect with people and share Regina in a way many have not seen. Dustin finds inspiration in so many places, so photograph he must! I found photography as a way to connect with other people at a time in my life when I needed a change. I started cooking and found the concept of creation and experimentation was a combination that really worked for me. Along the way, I stumbled across Instagram, which was a catalyst to what is now my strongest passion. The instant feedback and thrilling gratification eventually led me to the purchase of my first DSLR, and from there photography has been the driving force for my creativity. Where in the Regina do you currently live? I live on the south-west edge, which is only 15-minutes away from any anywhere you need to be in the Queen City. Being on the edge of the city makes quick trips outside of the city just a little bit easier. What’s your favourite Canadian city to visit? There are so many but if I must choose, it would have to be Montreal, QC. It has everything you could ever ask for, all in one city. I’m really fascinated to see how much culture and history there is on every corner. Oh yes, and the metro! Every now and then I revisit my time spent there and long for my next trip back. On your Instagram account, you post a variety of images – of people, plants, cats and buildings. What’s your favourite type of photo to take? My inspiration knows no bounds and I think it shows in my work. I usually go through phases, whether that be experimenting multiple-exposures, or a temporary pause in the rotation of my usual subjects, or even something as simple as something new catching my eye on the way to work; my work is always a good indication of things close to me at any given time. What about photography intrigues you? Photography for me is a perfect balance of art and science. I’ve realized how equal parts technical details and artistic expression come together to provide the ideal platform for me. Since day one with a camera, it’s all been about experimentation and constantly learning. There are countless avenues to which I can further my photographic agenda, and each of them begins with trying something new. How does Instagram help to improve your brand? How does the social platform perhaps hinder success? I love Instagram and I don’t know what I would do without it. It has connected me with thousands of people which has been invaluable as an emerging artist. At first, I used Instagram as a tool to get instant feedback as well as channel to connect with the world. Now, I find that Instagram is a great tool to connect with people, locally. Last year, we held an Instameet and it was a great success, uncovering the underlying community we have in our own city. While it is a great tool, I find that it can be easy to get lost in the flood of social media. I like to think of social media as a tool to leverage other possibilities to connect, through local events, or to appreciate art in its physical form through printed work or exhibitions. Do you have a social media strategy in place for posting and sharing images? If yes, what’s one thing from this strategy you think others should incorporate? A) Keep it simple. I try to keep my writing to a minimum. Everyone knows the feeling of having to read through long captions, so I like to keep it light. B) Keep it simple. I like to keep it simple, that’s why I’m listing it again. I keep my tags minimal as well; only a few, at most. I don’t try to hide them, or sneak them inconspicuously into my posts. There are some groups that I am proud to represent, such as #fromhereandaway or#believeinflim, so I have no problem with them showing, right out there in the open. C) Native features. Software evolves and I like to take advantage of new features. Geotagging, User-Tagging, Boomerang, Hyperlapse, just to name a few. Developers worked hard on these cool features, why not use them, and work them into your brand and make them work for you? What’s the best part about getting to take photos and share them with Canada? I love being able to share my work with anyone. Being a proud Canadian, I love being able to share things I love, about where I am from, with other people that feel the same way. I feel a strong connection about my home and being able to connect with others through photography is a great feeling for me. What would you say is the hardest part of your role? It can be really difficult mentally; I often go through bouts of insecurity and self-doubt, which can be very detrimental to my creativity. The same goes for when I am not able to directly feed into my photography addiction, or if I am in a creative dry spell. As bad as times can get, it’s been pushing through difficult times that has often paid off the most for my work and me. What’s one of the most valuable lessons you’ve learned so far? Never be completely satisfied. There is always something new to learn; an alternative technique, a different angle, seeing things in a new light. No matter what, there is always something else out there. What would you tell to other up and coming Canadian photographers? Take your time and slow down. What is one thing you love about being a freelancer? The thing I love the most about being a freelancer is that I really love every project I get to work on. I am fortunate to not have to rely on my photographic craft as my primary means of income; that’s what my day job is for. Without having the burden of financial stability on my photography plate, it allows me to be very selective with the projects I choose to work on. It might be easier for me to list the places I don’t find inspiration. To put it simply, I find inspiration around me. It’s not one thing or the other thing, but where I am that dictates what draws my attention. Most of the time, though, it’s the Saskatchewan landscape that really catches my eye. Everyone has good and bad days on the job – how do you get through the bad days? Bad days are not easily avoided. When I’m in the thick of things, I usually benefit from a quick time-out. Taking some time to set everything aside and collect my thoughts will usually get me back on my feet in rough times. Thank you for your time, Dustin, and congratulations on all you’ve accomplished. We can’t wait to see more of your photos!